NASA scientists have captured video of an event that emphasizes our own human puniness like almost nothing else could – a solar tsunami “hurtling through the Sun’s atmosphere at over a million kilometers per hour.” That’s right – a tsunami of fire that covers almost the entire surface of the sun. Yikes. 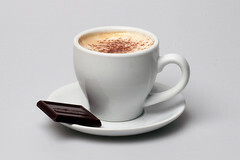 Attention Starbucks fanatics and chocolate fiends – stop feeling guilty about your caffeine jones. Turns out, you’re protecting your brain. A small Swedish town has become an environmental role model – calling on citizens to evenutally reduce their fossil fuel consumption to zero. After leading with this slightly ridiculous fact, the article goes on to quote Dr. Greene – “This will not be “fun” science, he said, “this is the real thing.”‘ First – “real” science is fun. Stop telling people that it isn’t – or you’ll soon be sorely lacking in festival attendees. And second – I’m sorry, you’re sitting next to a muppet. I’m pretty sure it’s going to be fun.